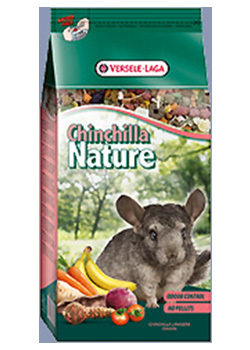 Chinchilla Nature is a complete feed adapted to the nutritional requirements of chinchillas. This premium blend of natural components contains all the essential nutrients, vitamins, minerals and amino acids your pet needs to live a healthy and carefree life full of vitality. Chinchilla Nature contains extra fiber, herbs, vegetables, fruit and supplements beneficial to health: for excellent digestion, good dental hygiene, a glossy coat and perfect health. The wide variation in ingredients guarantees great taste and consumption. Without pressed pellets! Chinchilla Nature Re-Balance is a complete feed adapted to the specific needs of chinchillas that are sensitive to certain food ingredients. Ideal for older chinchillas, chinchillas with a low level of activity, and overweight chinchillas. This premium blend of natural components contains all the essential nutrients, vitamins, minerals and amino acids your pet needs to live a healthy and carefree life. 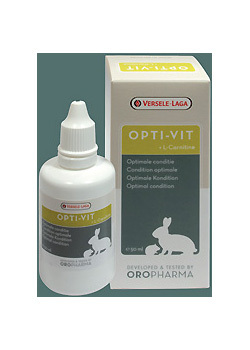 The light formula guarantees a balanced feeding pattern and the absence of wholegrain is ideal for animals sensitive to allergy. 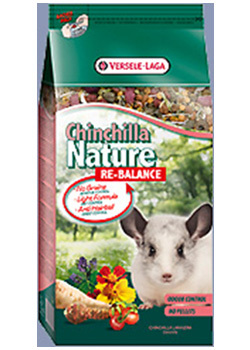 Chinchilla Nature Re-Balance contains extra fiber, herbs, vegetables and supplements beneficial to health: for excellent digestion, good dental hygiene, a glossy coat and perfect health. The wide variation in ingredients guarantees great taste and consumption. Without pressed pellets! 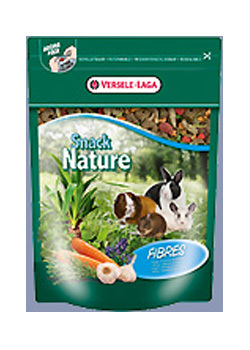 Snack Nature Fibers is a complementary food for (dwarf) rabbits, guinea pigs, chinchillas and degus. This delicious, healthy mix, crammed with crunchy and high-fiber herbal and vegetables nuggets, is a perfect supplement to your pet's daily menu and will stimulate both its condition and vitality. The tasty and fiber-rich Crispy Pellets Herbivores Maintenance is a complete maintenance food for rabbits and herbivorous rodents such as guinea pigs, chinchillas and degus. 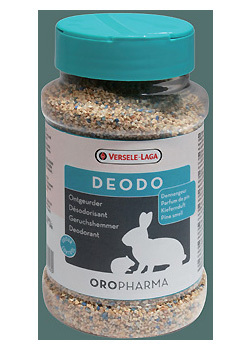 Without grains, these specially shaped pellets are rich in herbs... Real Happy! 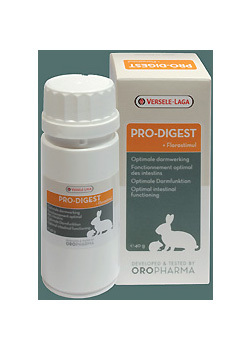 The all-in-one pellets eliminate selective eating and the light composition prevents obesity. Thanks to the "Happy & Healthy" mix in the pellets, Crispy Pellets contain all the nutrients that your pets need to live a long, healthy and happy life. But that's not all! The specially shaped pellets and high fiber content keep the teeth in great shape. The Florastimul does the same for the digestion and the yucca extract reduces unpleasant odors in the animal pen. You don't need anything else. Because of the added vitamin C, Crispy Pellets Herbivores Maintenance is ideal when keeping different herbivores, such as rabbits and guinea pigs, together, so that you only need to buy one feed. This product comes in 25 kg bulk packaging with window. 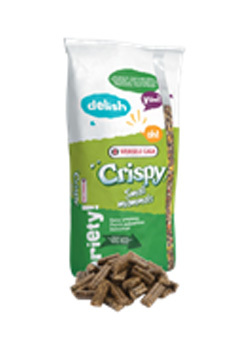 Crispy Pellets Herbivores Maintenance is easily recognizable in the shops by its striking dark green color packaging. Note: This polyvalent bag is used for several products. Make sure to look at the label at the bottom of the bag to see if it indeed concerns Crispy Pellets Herbivores Maintenance. Do not hesitate to try it out and take a bag home. Your pets will thank you. 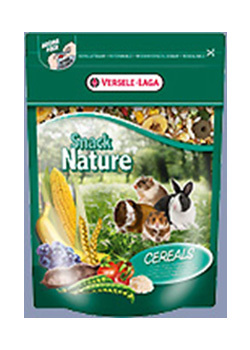 This product is not available in small packaging, but Crispy Pellets Rabbits has a similar composition and pellet shape. Note: This formula is only suitable for rabbits. Crispy Pellets Guinea Pigs for guinea pigs is available in small packaging. For chinchillas and degus there is Crispy Pellets Chinchillas & Degus. These are specifically tailored maintenance feeds, albeit with a smaller pellet shape. The bulk packaging of Crispy Pellets Guinea Pigs and Crispy Pellets Chinchillas & Degus contain a breeding feed with a higher content of protein, calcium and vitamins, suitable for young animals and pregnant/lactating females. That is why they carry the "Breeder" label. The tasty and fiber-rich Crispy Pellets Chinchillas & Degus is a complete pellet feed for all chinchillas & degus. Without grains, without added sugars and rich in herbs... Real Happy! This is an all-in-one formula that helps to eliminate selective eating. 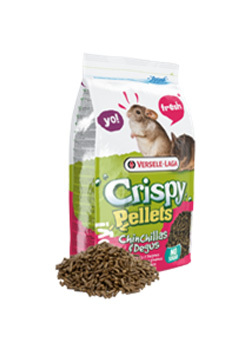 Thanks to the "Happy & Healthy" mix in the pellets, Crispy Pellets contain all the nutrients that your chinchilla or degu needs to live a long, healthy and happy life. But that's not all! The ungrounded fibers and the tough pellets keep the teeth in great shape. The Florastimul does the same for the digestion and the yucca extract reduces unpleasant odors in the animal pen. You don't need anything else. This product comes in resealable 1 kg fresh packs with window. Crispy Pellets Chinchillas & Degus is easily recognizable in the shops by its striking bright pink color packaging. Do not hesitate to try it out and take a bag home. Your pet will thank you. Are you looking for a maintenance food in bulk packaging for chinchillas or degus outside the breeding season or for animals that are not used for breeding? Then you should choose Crispy Pellets Herbivores Maintenance. The large pellet provides extra gnawing fun and dental care. The light composition prevents obesity. Moreover, this product is adjusted so that it is also suitable for mixed pens. 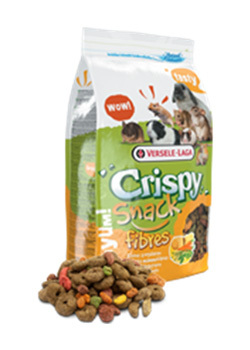 The tasty and fiber-rich Crispy Snack Fibers is a complementary feed for pets such as rabbits, guinea pigs, chinchillas and degus. With delicious alfalfa rings, vegetable bits and carrot crunch... Real Yum! Yum! It's a gourmet variety mix for your precious pet. This Crispy Snack is a real Happy Snack. Happy Snacks add variety to the menu and reinforce the bond between you and your pet. This product comes in resealable fresh packs, with window, of 650 g and 1.75 kg. Or in bulk packaging of 15 kg. Crispy Snack Fibers is easily recognizable in the shops by the striking small packaging with its light brown color or the bulk packaging with its dark green color. Note: The polyvalent bulk packaging is used for several products. Make sure to look at the label at the bottom of the bag to see if it indeed contains Crispy Snack Fibers. Do not hesitate to try it out and take a bag home. Your pets will thank you. The origin of this mountain hay guarantees a rich botanical diversity. 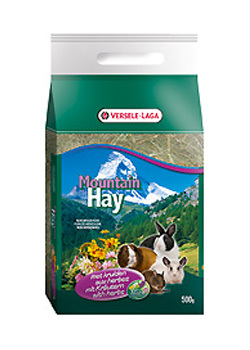 This 100 % natural product with a herbal aroma, is high in fiber (> 30 %) and supports both the digestion and the dental care of rabbits and herbivore rodents (guinea pigs, chinchillas, degus...) Always provide hay in your rabbit's or rodent's house. It is an ideal and essential complement to the daily diet and an unlimited amount may be provided. Dust-free, sundried and with a wonderful scent. 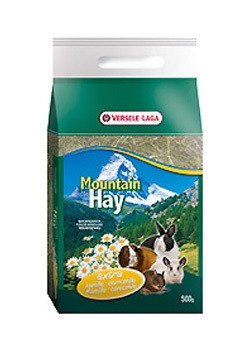 The origin of this mountain hay guarantees a rich botanical diversity. 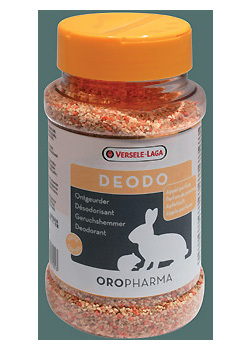 This 100 % natural product with a camomile aroma, is high in fibre (> 30 %) and supports both the digestion and the dental care of rabbits and herbivore rodents (guinea pigs, chinchillas, degus...) Always provide hay in your rabbit's or rodent's house. It is an ideal and essential complement to the daily diet and an unlimited amount may be provided. Dust-free, sundried and with a wonderful scent..